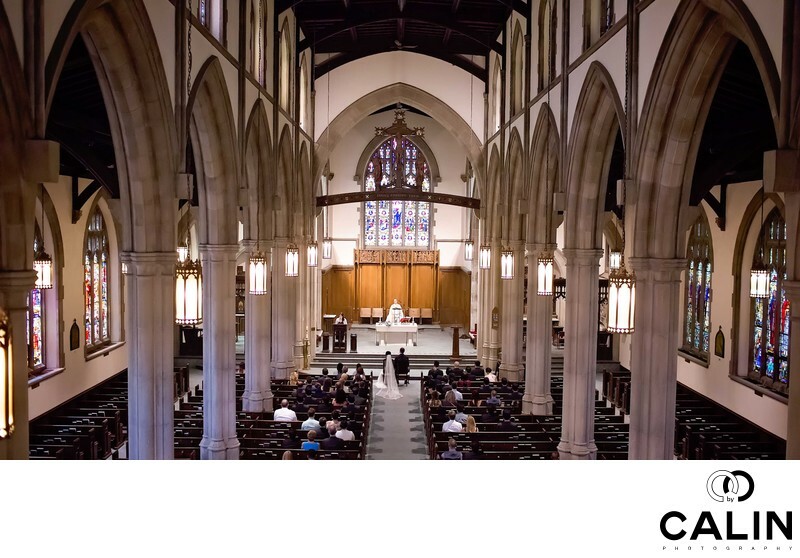 Holy Rosary Church is the perfect setting for your wedding ceremony and your family photos. As a Toronto wedding photographer who has seen plenty of churches and temples, I can attest to its beauty. This image was taken during the wedding ceremony from the balcony. I learned to be at the church 15 to 20 minutes before the ceremony so I can ask the father about any rules the church might have. In this case, the Holy Rosary Church did not allow flash photography during the ceremony but only during the processional and the recessional. You need to understand that despite its beauty, the church is dimly lit, which makes wedding photography challenge. Fortunately, my prime lenses served me well during this Holy Rosary Church wedding where I shot wide open using a very high ISO and a low shutter speed to allow plenty of light onto my sensor. I created this image minutes after the wedding ceremony started. I asked my second shooter to stay put then I ran upstairs and shot a few frames from the choir loft. In this wedding picture you can see the beautiful architecture of the church. Built in 1892, the church retains most of its originality and impresses with its massive pillars and splendid stained glass windows. According to Msgr. Robert Nusca, the church boasts the most beautiful stained glass windows in Ontario. The image features not only the church, but also the bride and groom and their families sitting in the front pews. This is a symmetrical image with the aisle and the pillars forming leading lines towards the couple. To capture this image I used a 35mm 1.4 lens on a Canon 5D Mark three camera, my wedding photography workhorse. I have seen plenty of black and white pictures of this church taken by various Toronto wedding photographers. In my opinion converting this picture in black and white wouldn't do justice to the beautiful establishment. As such, I colour corrected portions of this photograph so that the various light sources with different colour temperatures blend together in a perfect photo. Also, I applied a soft vignette so that the emphasis is on the bride and groom situated in the centre of the photograph. After the wedding ceremony, the bride and groom chose to have a few family photos taken next to the altar. To illuminate such a large scene, I used my Profoto B1 shot through a translucent umbrella. There is no doubt this is one of the most beautiful wedding pictures I saw at the the Holy Rosary Church. Unfortunately, I wanted to take some more photos off to the guest left, but unfortunately there was another mass so we did not have time. During my next wedding of this church I am planning to take a few more photos from the church choir loft, one of them being a picture of a bride walking down the aisle capturing the exact moment when the bride enters the church. Also I have in mind so many other creative concepts that will emphasize the beauty of the stained glass windows and use them as backdrops to create visual masterpieces. Location: 354 St Clair Ave W, York, ON M5P 1N4.